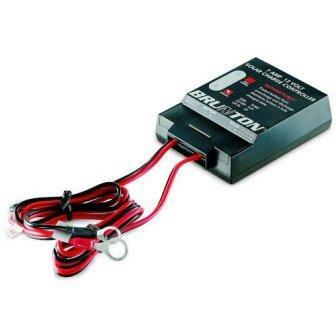 Description: The Brunton Solar Controller 12v Battery Charging Monitor is an helpful tool to help you avoid overcharging your 12-volt batteries. The manufacturer says that once connected you can charge your 12v battery nonstop for days. The controller will cut off the power when charging is complete. It’s also good for maintaining the battery in its fully charged state (i.e. RV parked for days or boats). It’s compatible with most of the solar panels (of different brands too) available. What I Liked: It’s a normal controller…not so much to say. Brunton is a good brand. The led indicator are helpful to know when the battery is full. What Needs Improvement: The controller is nearly perfect…great job! The controller is easy to install and provides an indication of “charging” or “charged”. It measures 3.8 x 1 x 2.7 inches; weighs 4.2 ounces. Before you attach it to the battery both the CHARGING and BATTERY FULL light will be on. Once you hook it up to the battery it works well. It looks very standard in its construction. Versatile for every solar panels. Share Your Thoughts: If you’ve bought the Brunton Solar Controller, tell us what you think. Note: Comments in the resources section may occasionally be pruned. Is the Brunton Solar Controller 12-Volt Battery Charge Monitor weather and temperature proof? I would like to use this for my RV year round. yes it should be proof. Consider the place where you’ll be install it. I don’t reccommend You to put it near the top of Your RV. What solar powered battery charger do I need to get for my boyfriends boat? He wants to use it as a back up source for charging the battery while on the water? I have a 140watt bifold panel. which solar controller would be best to use with this panel to keep my battery bank of 175ah (agm) charged. Are these solar controllers produced by your factory? I am in solar power unit design field. Just beginner. Please reply what is the thumb rule to select solar charge controller. As for example 600 Watts is connected load. Here in India it is 230Volts. We select solar panel 600Watts x 1.25% =750 Watts. Accordingly Battery selected 750Watts / 12 Volt =62.5 Amp Please inform method of calculation to select solar charge controller between solar panel & Battery. Further, I shall be thankful if you will please inform the complete technical data, information to design solar power supply unit as for example 1000 Watts connected load. Then how solar panel,charge controller,battery,inverter selected? Your guidance and information is valuable to me. I have 12v battery but how to charge these on solar panel through and which panel i can use it..? We have a 12 vol DC Flojet water pump we use to water our livestock from a pond. The pump draws 7 amps. It is connected to two Siemens 50 solar panels, 100watts, 7amps, which charges a 12 volt marine battery. We have used the B-Z mini charge controllers and a Sun. They overcharge the batteries plus do not have a low voltage disconnect, LVD. Do you have a charge controller that is more reliable? All the controllers we have used quit working after a couple years. The B-Z look like something got hot on the back side. Epoxy appears partially melted. Why?? I have a small solar system and need to know which charge controller you would recommend.